The presence of drones in construction means significant changes within the industry. Drones have already begun changing the way the construction industry operates, and those changes will have continued and lasting effects. Here’s a look at some of the ways drones have already changed the industry and how these trends will impact construction operations in the future. Unmanned Aerial Vehicles (UAVs) are rapidly replacing traditional land-surveillance methods. They are growing in popularity so rapidly that some have even abandoned the classic “bird's-eye view” expression with “drone's-eye view.” Drones greatly reduce the labor and time involved in producing accurate surveys. Drones eliminate much of the human error involved in the process and have the ability to capture necessary data in much less time than traditional methods would take. Drones provide superior endurance and intelligence on job sites. Their ability to collect and report data allows them to complete work faster. The need for manual labor is all but removed from the equation. In the future, drones will take on even more integral tasks involved in large projects. They are poised to cut the time it takes to build a skyscraper by a broad margin, thereby cutting costs. Contractors who rely on drones will be able to make much more ambitious bids and complete work on time. Drone technology has evolved to the point where instant connectivity and communication on the job site are at a surplus. Drones are being used more and more as a means of maintaining constant contact at worksites. 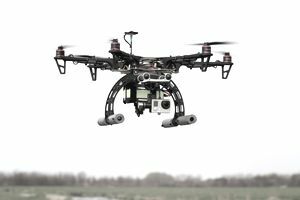 Drones that feature mounted cameras can provide video footage to facilitate communication and surveillance. They allow companies to keep tabs on employees and workers and are considered an increasingly invaluable tool for superintendents and investors. Already, communication and management are seeing a sharp increase in efficiency due to the ability to collect real-time data from drones. The decrease in delays in gathering data is having more of an impact each day. The ability to manage workflow 24/7 is unprecedented and is certain to have a significant impact on all manner of construction processes. The advent of drones is causing a sharp increase in security efficiency. Whether the drones are used to maintain the safety of employees or to protect the job site from theft or vandalism, they are steadily seeing greater implementation in the construction industry. Drones have the ability to be practically everywhere at the same time. They don't just reduce theft and keep workers safer; they create a round-the-clock real-time monitoring system that has already been adopted by a number of construction companies. They elevate onsite security and safety by a tremendous margin. Even though the FAA exacts strict standards on the use of drones, most models used by construction companies come in under the 4.4-pound weight threshold and 400-foot travel radius required to be considered “Hobby Class.” Drones that meet those criteria are not subject to stringent regulations. As of right now, they can be flown practically anywhere for any reason. Drones can also safely survey dangerous locations, reducing workplace accidents and increasing job site safety. The use of drones in job site inspection also means a drastic increase in worksite safety by eliminating numerous dangers and safety hazards. Using drones to transport goods aerially allows companies to execute difficult inspections and keep track of everything that enters and leaves the job site. It saves money and time and keeps the site secure. Since drones are generally small with high levels of maneuverability, they are being used more and more as an alternative to traditional vehicles. Even better, drones do not have to adhere to traffic laws, which allows them to make deliveries in a fraction of the time, using half of the resources. The construction industry is evolving at a rapid rate, and with all the innovations and changes to traditional methods comes the need for greater efficiency in every aspect of your business. As you consider ways to increase the efficiency of workflow, we recommend perusing Capterra’s growing library of construction management software that will help increase productivity and efficiency in your construction business.